Don’t be fooled by the title. This book is for anyone who has been blessed with the task of rearing girls. Single Dads, Grandparents, Aunts, Uncles & Guardians… use this book to guide you on your journey to success to your (Almost) Perfect Daughter! TEACH HER THAT YOU CANNOT START A LIFE OVER, BUT YOU CAN CHANGE THE WAY IT ENDS. Every mom wants her daughter to be successful. 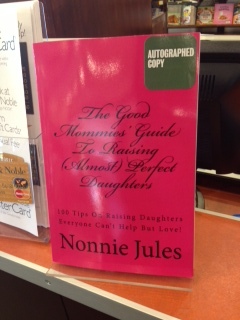 Every mom wants her daughter to have an easy road, and a very comfortable life, free of any kind of pain or heartache. Sometimes, even with the best rearing, our daughters stray and become people we don’t even recognize. There are many influences in the world, some good and some bad, and sadly, sometimes our daughters are attracted to and drawn to the bad. If this happens, all we can do is PRAY and ask that the Lord watch over our child and keep her in his care. When all your prayers have been sent up and received, the day will come when your child sees the error of her ways and she heads back to the fold, into the safety of your bosom and your arms. She may feel as if she has messed up royally and is too embarrassed to face the world as she once knew it. It’s at that time, that you should let her know that she cannot change what has happened in her past, but she can surely dictate her future from that point on. Just now purchased my autographed copy since I didn’t win anything.lol Will spread the word.